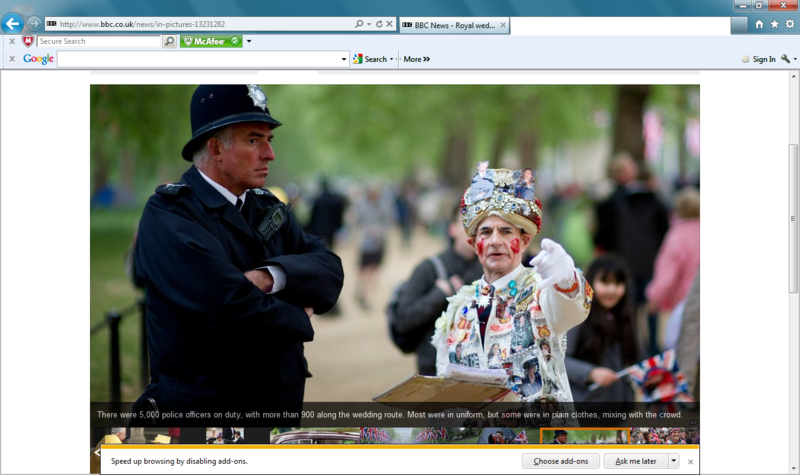 Having a poottle on the BBC website yesterday, and flicking through some of the photos from a certain wedding in a certain city, I came across this great image – of a rather serious but bemused copper standing, arms crossed next to a chap decked out in, well I’ll let the photo do the talking on that one. But what made me really chuckle was the caption that went with the image “…… Most were in uniform, but some were in plain clothes, mixing in with the crowd.” which left me wondering who wrote the caption, and did they do it for a bet / a laugh? !